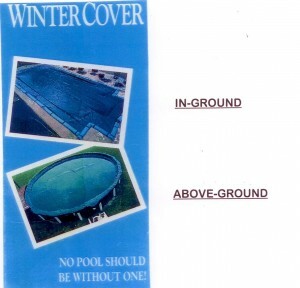 We stock every standard size pool cover for above and in-ground pools. Aquavita also has 8′ and 10′ water tubes, winter plugs, winter kits, air pillows, cables & winches, skimmer door enclosures. SEE OUR CHART TO SELECT CORRECT COVER SIZE. Please note that above-ground covers are made 3′ larger than pool size and in-ground covers are 5′ larger than pool size.